There were many, many questions surrounding Anthony Joshua’s calibre going into his enormous unification clash with Wladimir Klitschko at Wembley Stadium this weekend. Most of them concerned his ability to handle a crisis and how he copes when things aren’t going his way. It is difficult to say he answered all of them in one fight but he is on his way to being a great himself. On his current trajectory, he will become boxing’s first billionaire. He may never again be involved in a fight as epic as Saturday nights. He may never have to prove more. Boxing may one day even turn sour for him. But he is unforgettable now. With 90,000 to witness it at Wembley came a setting to intensify the intrinsic thrills. But that night will go down as the night boxing so badly needed, an actual fight that lived up to the hype. The fight was an actual contest, between a new up and coming fighter and an ageing legend. And on Saturday night the fight exploded in front of 90,000 people at Wembley and millions around the world. Packed with celebrities and old time boxing greats in the front row, a boxing contest unfoiled. A knockdown in the 5th by AJ only to be followed by one of the best punch knockdowns by Klitschko. 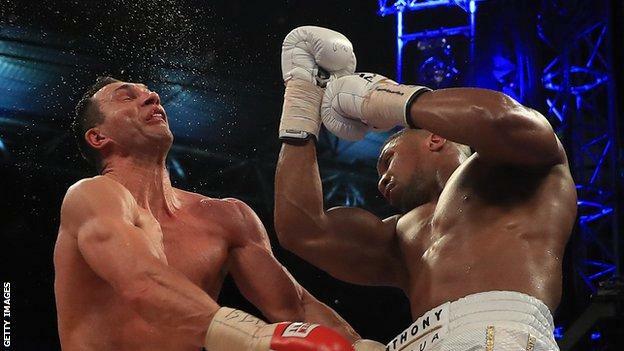 They way AJ regrouped, whilst Klitschko was trying to land a killer combo, followed by the explosive round where AJ went on the offensive and overpowered his opponent. It was almost like one of the Rocky movies, entertainment at the highest calibre. In the process, Wembley has put itself on the world map, as a spectacular venue that can host the biggest and best events. 90k spectators and an atmosphere that shook the world. Boxing is a niche sport in many countries and a sport in decline in many others. With 11 current world champions, Britain is entering an unexpected golden age that may yet produce more nights like Saturday, not least should Tyson Fury shed the weight and demons to line up another heavyweight clash with Joshua. In Joshua, boxing has a heavyweight champion embraced on a global scale, and he has plans to win more titles and bring more historic nights back to Wembley Stadium. Fights against Deontay Wilder, Joseph Parker and Luis Ortiz are all huge events but make no mistake, Joshua-Fury will eclipse them all. Even The Terminator approved of this contest…………..